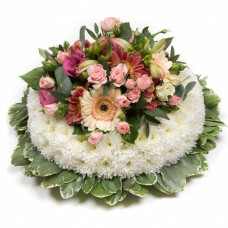 We can create and deliver funeral wreaths for you and we take care to ensure that the wreath you select is recreated to the highest possible standard by a professional florist and delivered with care and attention . 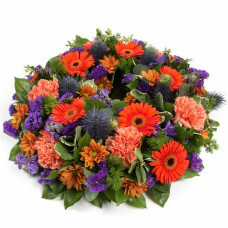 when you decide to choose funeral wreath made by Alison's designer Florist in Maghull Liverpool you can do so with confidence, knowing that it will contain your specific requirements. 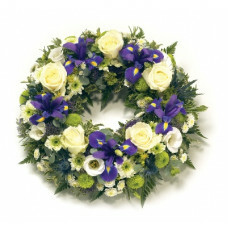 and will delivered promptly to your chosen destination, giving you peace of mind. 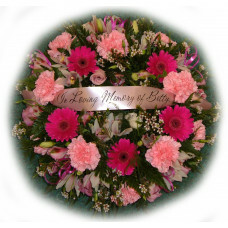 Sending funeral wreaths to Kirkby,Maghull, Lydiate, Melling, Aintree, Aughton, Ormskirk, Bootle,Liverpool and surrounding area of Merseyside has never been easier, quicker or more reliable. 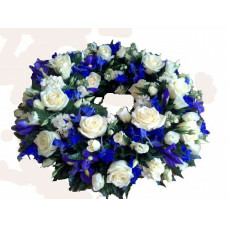 A classic wreath shaped design created using a mass of white double spray chrysanthemums and finishe..
A open design Everton blue and white wreath made with White Rose,Irises,delphinium,carnations and a ..
A classic selection of flowers including irises, carnations and spray chrysanthemums in Cerise ..
A open design pink and white wreath made with roses carnations and seasonal pink flowers..
A open design Wreath of white lilac purple and blues with foiliage made by Alisons designer fl..
A open design soft pink and white wreath made with roses carnations and seasonal pink fl..